Come Fly With Us: Introducing... Baby Cookie! She's here! Baby Cookie is FINALLY here! 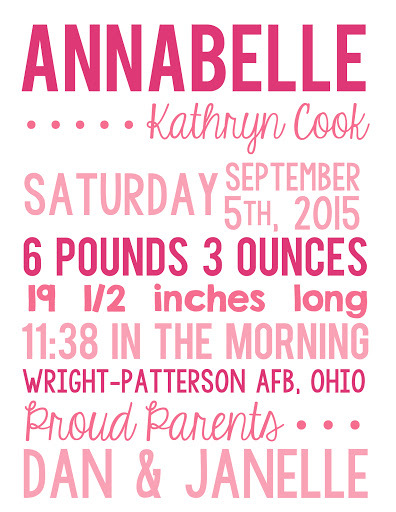 Annabelle Kathryn Cook was born at 11:38 AM on Saturday, September 5th, 2015 at the Wright-Patterson Air Force Base Medical Center in Dayton, Ohio, weighing in at 6 pounds 3 ounces and 19.5 inches long... after 37.5 hours of labor. 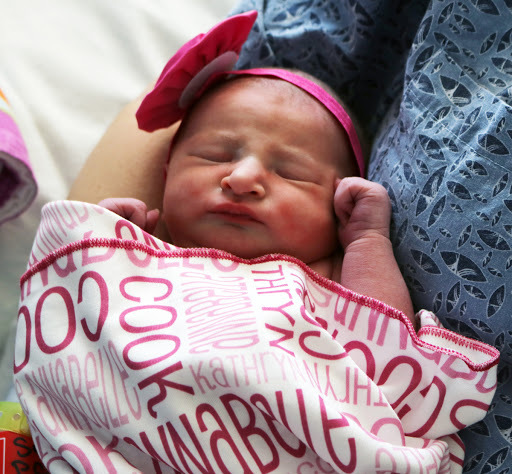 She is just as cute as can be, and we can't get enough of her! I'll share the story behind her name soon! Congrats! I am so happy for y'all! Congrats! She is so pretty! YAY! She is absolutely wonderful <3 Congrats! Congrats! :) Hope you all are doing well. She is just beautiful! And I love that blankie! Congratulations! I'm sorry I missed this (first birthdays are crazy town, just wait). She is perfect and I am so excited for you guys! I love the blanket! Where did you get it? And HOLY CRAP 37.5 hours of labor?!?! Woah!!! Congrats!! She is so sweet!! Yippee! Hope you have recovered from that marathon of a labor!